Historically, the most annoying aspect of Russ & Daughters, aside from the fact that it’s pretty much always a zoo, has been the lack of seating. Sinking your teeth into a “Pastrami Russ” on a dirty Houston Street bench, inhaling bus fumes and listening to the sweet sounds of never ending construction has never felt right. But things are different now. 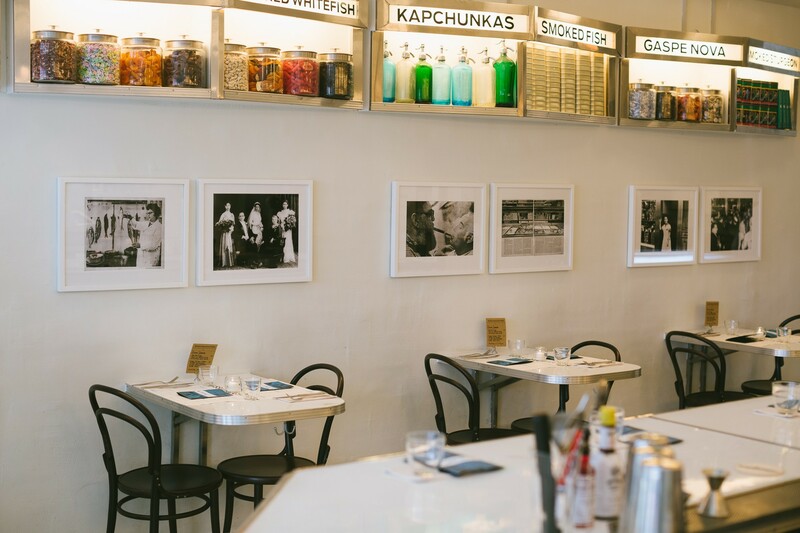 For their 100 year anniversary - yes, they opened in f*cking 1914 - Russ & Daughters has finally decided to expand and open Russ & Daughters Cafe, a place where one can finally enjoy all of their classic “appetizing” delights from the comfort of a cushy booth. They’ve done a fantastic job with the space, giving it the full retro diner look, while also staying true to the original R&D; vibe. The menu has expanded too, as this is heeb-tastic diner food at its very best. They serve breakfast all day, including eggs, bagels, smoked fish, matzoh ball soup, and all kinds of Jewish comfort food. All the classic bagel sandwiches come laid out on photogenic wood boards, which you’ve no doubt seen in your Instagram feed. Russ & Daughters has always been equal parts #EEEEEATS and experience, and that remains true at the Cafe. They’ve done a great job of bottling up the energy of a classic New York experience, and transporting it down the block to a new location. So congrats on 100 years and one new location, Russ & Daughters. If I live that long, please deliver me the biggest smoked fish platter you’ve got, and 500 grams of the Osetra Gueldenstaedtii caviar please. That’s on the menu for $1,970.00, just in case you were wondering. Sounds like a good way to get all meshugena at an old age. Pretty much as good as mushy, glorious knishes can get. Probably the best thing on the menu. A combination of baked salmon and smoked salmon, served iced cold, and with waffle crisps for dipping purposes. It’s essentially the best salmon tar tare you’ll ever taste. Don’t snooze on the chopped livaaaaah. Its composition is such that even those who don’t love liver can get down with it. Creamy and smooth, cover a piece of matzah with this stuff and sprinkle some picked red onions on top. You’ll be a happy camper. A play on their classic bagel that they sell at the original location. One of their specialties is curing smoked salmon in a pastrami crust. This is one of the best things you can possibly eat here. Small sandwiches pastrami smoked salmon, muenster cheese, sauerkraut, mustard and pickles on soft, salty pretzel buns. So, so, so awesome. Classic soup at a classic spot. This is a no-frills matzo ball soup - just excellent chicken broth, a big plump ball, and some carrots. Infatuation approved. You are in charge of putting together all your favorite bagel sandwiches now, served to you deconstructed on a board. The Classic is my personal move, always. If you’re a sturgeon fan, get the Mensch, and if smoked sable is more your speed, the Shtetl is your board. There are a bunch of awesome egg options at Russ & DaughtersCafe, most including some form of smoked fish. This one is our favorite. For you non Hebrews, matzo brei is like what would happen if scrambled eggs and french toast had a baby on Passover. Actually, that probably doesn’t help. If you’re hungover and need a light but hearty meal, this is your move. Sunny side up eggs, smoked salmon, and potato latkes. Breakfast is served. One bite of this sh*t will have you thinking of going all Amare’ Stoudemire and converting to Judaism full time. Welcome.